It's quite simple, but this week my eyes went to God's fingerprints on summer. The fresh corn. The watermelon. The peaches. The cherries. They're all so easily overlooked, but what a blessing to have beautiful and delicious foods, that provide us nutrients as well! Love that! What a great post.....I love the fingerprint of God. Sorry, I accidentally typed in my link wrong on entry #2 (oops)...#3 is the correct link. I love summer too and see God's fingerprints everywhere! Love your blog and your pics! although i think marshmallows covered in chocolate and sprinkles might be considered a gift from God too! Off to do some shopping! God's fingerprints certainly are all over this beautiful world He created for us! I see the fingerprints of God in everything,but particularly this morning in the sights and sounds of summer, A humming bird on the trumpet vine, the tick tick of the sprinklers, the cows mooing in the pasture near us, the fresh tomatoes ripening on the vine. We have soo much to be thankful for. Beautiful! And your house photos are amazing! What a wonderful fingerprint, tasty too. 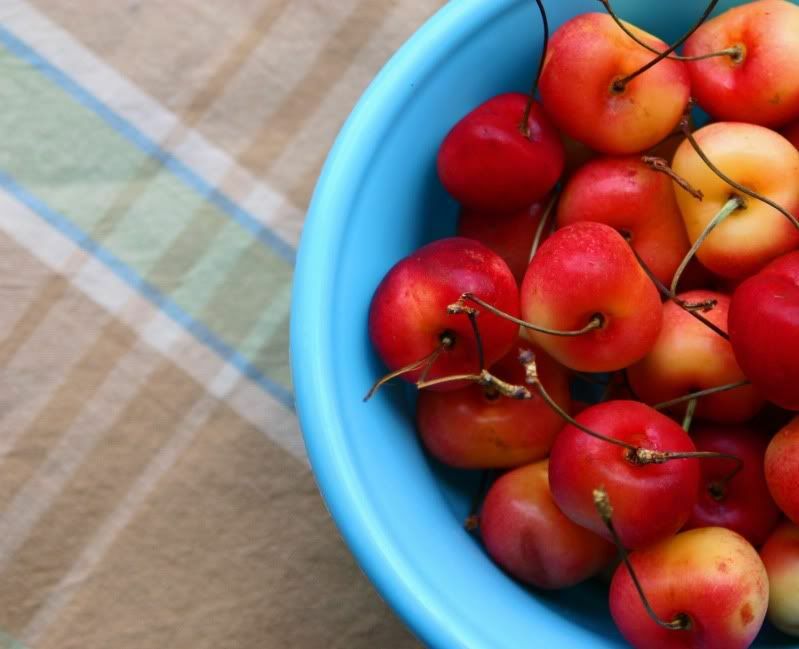 Great photos..
Beautiful photo of those delicious red cherries in that gorgeous blue bowl. Sometimes we take some of our favorite things for granted. Thanks for the reminder to offer up a prayer of thanksgiving for all of those lovely and yummy foods of summer! Love summer food! Especially all the fresh fruit and veggies!! YUM-O!